Ever hear of the G-BOMBS diet? Dr Joel Fuhrman recommends eating certain micronutrient-rich "superfoods" every day. 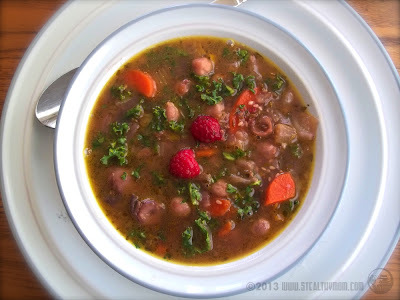 Greens, Beans, Onions, Mushrooms, Berries and Seeds. For the last couple of weeks, ever since seeing his show during a public television fundraiser, we have been trying to include these foods in our usual "Five a Day" fruits and vegetable goals. How could it hurt? For fun, I put them all together. This stew could be called "G-BOMBS Plus" because it includes servings of carrots, celery, and cabbage, too, all enveloped in a rich sweet and sour broth. Garbanzos and a sprinkle of raw kale just before serving give it a bit of crunch. Stir the carrots, celery, onions, and olive oil together in a soup pot. Gently sauté until the carrots are softened, about ten minutes. Layer the cabbage, kale, and mushrooms on top. If the garbanzos are frozen, just dump them out of their container and let them thaw as the other ingredients cook. If you use canned, rinse them well and place them on top. Put the lid on the pot and allow all of the ingredients to cook for another ten minutes. Stir in the parsley, coriander, raspberries, lemon juice, sesame seeds and six cups of water. Stir in half of the salt. Place the lid back on the pot and simmer for about an hour, stirring occasionally. Add the other half-teaspoon of salt to taste. Prior to serving, garnish each bowl with a small handful of the chopped, raw kale and a couple of raw berries. For more natural recipes visit the Hearth and Soul Blog Hop, Fat Tuesday, Healthy 2Day Wednesdays, Real Food Wednesday, HomeAcre Hop, Simple Lives Thursday and Empty Your Archives. Your G-BOMBS stew sounds delicious as well as nutritious. What a lot of wonderfully wholesome ingredients! I am intrigued by the addition of the raspberries; I'm sure they lend a wonderful flavour. Thank you for sharing this post with the Hearth and Soul hop. I will admit that the "berries" part of the "G-BOMBS" is the hardest for me to work into an entree. This turned out well, but would have been much different if my pantry was not wanting for currants!